Don't forget the new JustRite Contest started yesterday - you can read all the details here. For my card I used the Pre-Inked 2x Get Well Stamper and my SAMJ to stamp the bandaids on my caramel card stock, sponged the edges in chocolate chip and layered on a piece of chocolate chip card stock. Place stamped panel on vanilla panel (edges where previously sponged with chocolate chip ink), then onto chocolate chip base card. 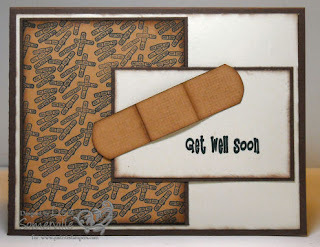 To create my Faux Band-Aid, I cut my caramel card stock to 3/4" x 3", stamped my canvas background with chocolate chip ink (that had been stamped off twice), and rounded my edges. To give my Faux Band-Aid a more realistic look, I scored in 2" from both sides, edged all sides with chocolate chip ink using a sponge dauber. I stamped my sentiment - again from the Pre-Inked 2x Get Well Stamper on vanilla card stock, sponged my edges, and layered on a piece of chocolate chip card stock. I attached the Faux Band-Aid with mono, placing a dimensional in the center to give it that added puff. Layer on card as shown. That band-aid looks so real! Great card and good luck with this round!!! Your "faux bandaid" is awesome--I thought it really was a bandaid! cute card! O! I thought you were so smart to use a real bandaid on your card! Fooled me. This card is so cute. What an adorable card! I too thought the band aid was real! Clever!